Start with buns, rolls, and dumplings -- but don’t order too much, ‘cause this is a marathon, not a sprint. If the restaurant uses carts, you can always order later from the menu or ask them to return (hahaha good luck with that). Maybe order a few noodle dishes, something weird like tripe or chicken feet, and don’t neglect the vegetables (or do -- the food pyramid is probably a scam anyway, right?). Get durian puffs, egg custard tarts, or anything with black sesame paste for dessert. Drink lots of tea. 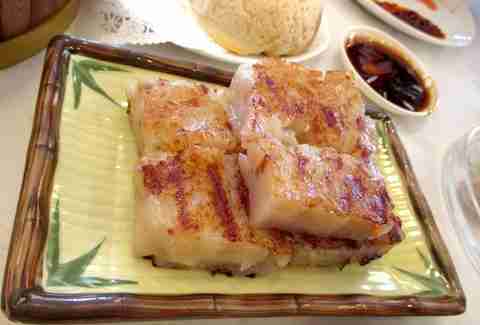 Millbrae is full of dim sum destinations and Asian Pearl just might be the crown... pearl?... of the airport city. 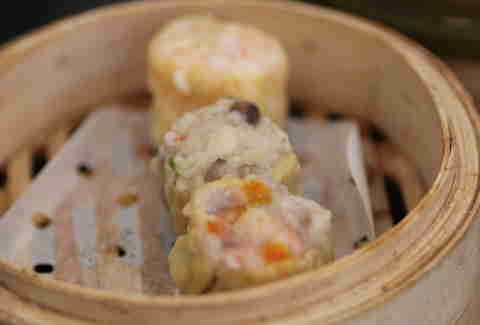 This is grown-up, elegant dim sum: the steamed radish cake is properly grease-free, they've got some artsy dumpling options, and then there's the wasabi pork stomach -- just do it. The desserts? Tartine-quality: exemplary black sesame balls, durian puffs, and gooey, charred-in-all-the-right-places Portuguese custard "egg" tarts (relation to Hong Kong? Not sure, but Macau is a 40-minute hydrofoil trip away). Bonus: there are also branches in Richmond and Fremont for the 510 crowd. 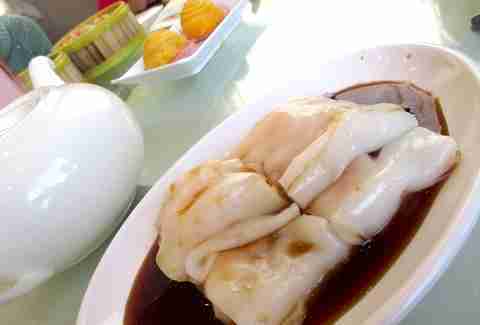 Like dim sum’s home, Hong Kong, Alameda is an island. Food & drink aren't what this East Bay island are known for, outside of one Tiki bar (appropriately enough), but the incredibly comfortable (and oddly civilized) cart-filled dining room of East Ocean Seafood is an exception. 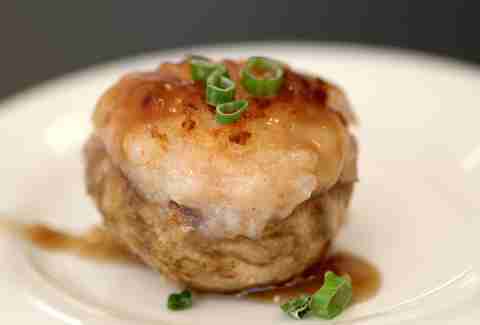 The classics are winners, like delicate dumplings screaming with Dungeness crab (now in season! 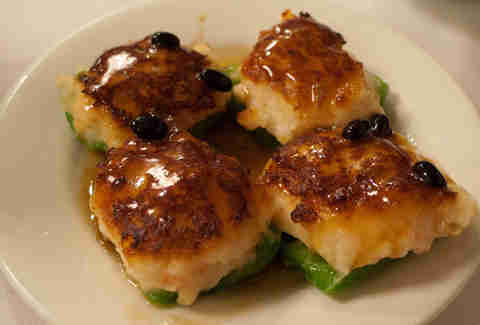 ), or the funky marinated seafood and pork wrapped in bean curd skin. Finish with durian custard-filled pastry puffs which are sort of like beignets gone haywire. If there’s one place to get take-out fare in Chinatown, Good Mong Kok Bakery is it: a seatless, bargain dim sum shop where the pork buns, pork and shrimp siu mai, and myriad other filled dough selections are right on par with the Bay Area's best of the best. Make sure to grab a steamed egg cake for dessert, and then eat that on your way to nearby Golden Gate Bakery for second dessert: the fabled egg custard tarts (just make sure you check is-the-golden-gate-bakery-open-today.com first). It’s in the heart of SF’s Chinatown and President Obama ate here two years ago. Soooo there's that. Balance the various good-but-not-top-flight dumplings with zhiu zhou dumplings, which are Falstaffian plump and alluring with peanut and cilantro. This is the place to rock the seafaring side of dim sum: do the deep-fried seaweed roll with fish and the unique spiced, salt-baked octopus. Reports say POTUS ordered basically half the menu. Follow his lead with some mushrooms stuffed with fish paste and deep-fried red bean balls. 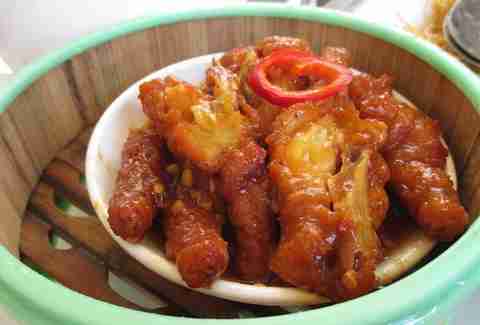 Leave with memories of sliced pumpkin fried tempura-style in a salty egg yolk batter. A Bay Area classic, Hong Kong Lounge I used to be the place for dim sum, became too well known, and then fell into the enormous crowds/drop-in-quality hole. Waits have lessened of late, the dumplings have found their perk, and it’s again the toast of the town. It’s a cart-free zone, but not a mess-free one -- the tea pots are basically impossible to pour without spilling everywhere. The baked goods will be your highlight; this is basically the dim sum equivalent of a Parisian bakery. It’s hard to pick a winner between HK Lounge's version of the steamed BBQ pork bun and the fabled one at Tim Ho Wan (the world’s cheapest Michelin-starred spot!). The only thing better is the incomparable, butter-rich egg custard steamed bun. There’s weirdly no relation between Hong Kong Lounge II and I outside of both being on Geary Blvd, just 22 blocks apart (though II’s owner used to own I, but no longer does). Got it? It's a coin flip, though, as to which is really No. 1 in the dim sum book. No carts here -- it's a smaller, much more comfortable and well-designed room than HK Lounge I -- and just excellent all around. The xiao long bao is as good as the specialists in Millbrae make it and the fragrant, meaty pork ribs in "candy sauce" (beware the persistent little bones) are a must. Two under-the-radar items: the clay pot dishes (they’re much bigger than the typical dim sum dish, so order accordingly) and steamed fish balls. 92 items in total to choose from -- nice and compact. With way more than just jook, Jook Time in the Outer Richmond is the choice when you want the bun-and-dumplings glory of dim sum without the drama... or the restaurant. Just point and choose. No stressful lines or cart crashes; just you with a fresh shrimp crepe roll, steamed BBQ pork buns (three for $2 -- the best snack/light lunch deal in the city outside of banh mi), and an awesome, nourishing small bowl of rice porridge (jook) with roasted fish, peanut, and chicken. You can't go broke here, and you'll leave with the leftovers equivalent of a week’s worth of groceries if you spend $12. With this take-out spot just steps away from Golden Gate Park, a dim sum and jook picnic overlooking Spreckels Lake is a given. No sharing with the buffaloes. Our South Bay entrant comes from Cupertino. Sharing a plaza with a 99 Ranch store (intense parking lot on weekends! ), Joy Luck Palace’s excellent, nearly translucent shrimp and chive dumplings offer crunch (they're pan-fried) and the very uncommon sweet/savory mashup of a Chinese donut wrapped in a squishy rice roll is well worth a journey and potential small wait in Apple’s backyard. Bursting with shrimp and pork, the siu mai crowned with fish roe are Joy Luck Palace’s tour de force. Clocking in with a modest 300 seats, this might be the cozy neighborhood bistro of dim sum spots. Almost as close to SFO as the rental car center, Millbrae’s The Kitchen utilizes various master chefs and consultants from Hong Kong and China (who definitely know what they’re doing) to help furnish lavish abalone- and crab-filled dinner banquets, and equally quality dishes during the day for dim sum. Check out top-notch chicken feet in black bean sauce with lots of nice gelatinous meat to gnaw on, and beautifully constructed dumplings… oh the siu mai. It’s not the latest, greatest, trendy dim sum joint, but probably the one that shifted dim sum focus in the Bay Area from the city to the Peninsula a decade ago. 500 seats strong, Koi Palace makes a Vegas Strip restaurant seem like an intimate wine bar. Luckily there are no carts; otherwise they’d need stoplights. Shanghai crab broth and pork-filled dumplings -- the ultimate filled dough example of surf and turf -- are the studs, best ordered in a large group so you also get a whole dang fried crab with the dumplings. 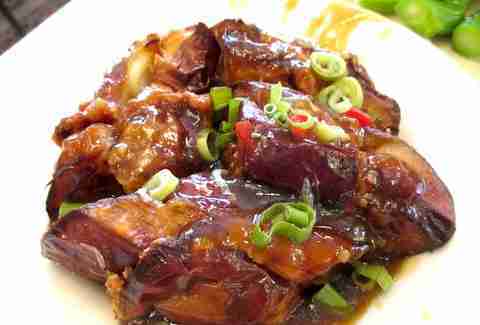 If you’re hesitant about molasses-sweet stewed chicken feet or not-rubbery stewed tripe, now’s the time to try them. Skip the lamb buns, but not the fried mochi balls filled with black sesame. Oh, and do not go on a weekend. Just don’t. On a weekday, there’s no wait. Millbrae and the Outer Richmond are definitely your dim sum epicenters. The Castro? Eh, not so much. Well, that is unless you're at Mama Ji’s, home to outstanding Shanghai xiao long bao dumplings and wobbly handmade pulled rice rolls (note: most dumplings are three to an order, compared to the customary four, and for roughly the same price... you’re paying for primo SF real estate). Of particular note are the crisp-on-the-outside and pillowy-centered seared pumpkin cakes that are really deep-fried pumpkin filled with red bean paste. They look like sci-fi corn cob orbs and taste like autumn in a bite. Dim sum rules at lunch ,but also takes up much of the dinner menu -- including Szechuan classics (where the Chef/owner Mama Ji is from) offered as dim sum, like the gigantic, palate-numbing plate of spicy cold noodles. And you can always enjoy Belgian beers on tap. Chimay and siu mai, ahhhhhh. Past the lions guarding this massive, three-story, 400-seat, eight-month-old giant, which shares three parking lots with Taco Bell and Burger King (they used to have no parking! ), you'll find elite-tier taro root rolls, durian pastries, chilled steamed tripe with fiery pepper sauce, and killer salted egg yolk-fried pumpkin. Show up with an entourage, because big plates are really where it’s at. 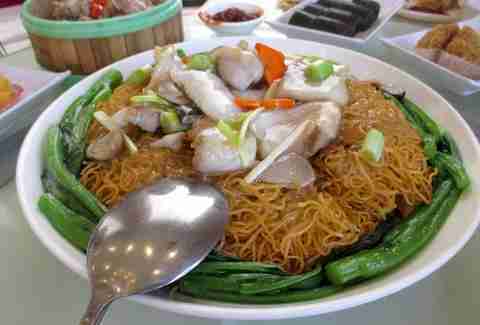 The (probably) 10lbs of fried noodles with fish are jaw-dropping, with a snazzy crisp exterior evolving into soft noodles towards the center. Across the street from The Kitchen, it's locked in an epic Millbrae showdown these days. One that we all win. Ton Kiang is ye olde Geary standby that's been around forever; a two-story classic that is one of the few Hakka Chinese restaurants in the city. 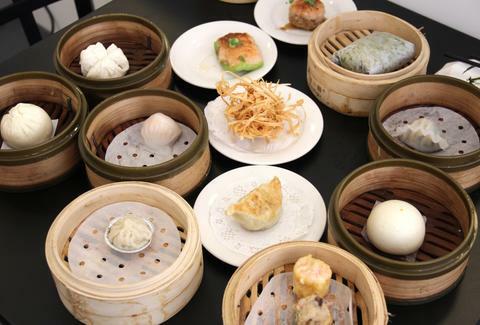 The dim sum is mostly made up of the usual BBQ pork buns and shrimp-stuffed eggplant, but explore the carts and you’ll encounter some unique selections: light-as-air green chive and shrimp dumplings or foil-wrapped chicken. 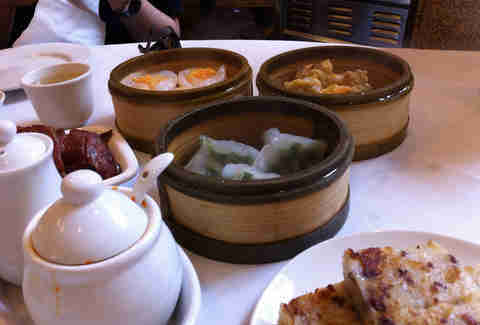 Date alert: $38 for any nine dim sum options, and Ton Kiang serves dim sum all day and at dinner. Just be aware that tourists will be everywhere because this is always Fodor's and Frommer’s favorite. Yank Sing remains the most celebrated (hello, James Beard classic award) and most gold standard-setting of dim sum joints in the Bay Area for good reason -- these guys know dumplings. The Shanghai soup dumplings are essential and the shrimp har gow alone should be as revered for perfection in texture and timing as Zuni’s roast chicken. Yes, Yank Sing can be too much -- its reputation and proximity to the Embarcadero and FiDi drive in locals and tourists at record speeds. The cart action is intense. Plan accordingly and go on a weekday or be smart and reserve. Yes, yes, you can reserve a table -- a rarity in dim sum. Another rarity? Peking duck, slid into a DIY taco with sweet hoisin and green onions. Trevor is a restaurants writer for SF Weekly and contributing editor for Vino 24/7. His nicknames include "Bulldog", "The Turtle", and formerly, "T-Bone", until George Costanza stole that from him. Follow Trevor @TrevorFelch.